At the turn of the 20th century, the southern slopes of the Muggia Hills became the focus of healthcare institutions from Trieste that organised the treatment of tuberculosis, the most serious illness of the time, related to life in the poor quarters of industrialised cities. Why was it that they chose this section of the Istrian coastline? The area of Valdoltra (Valle Oltra, Val d'Oltra – ‘the valley across’ (the bay) seeing from the side of Koper, as the stretch between Sv. Katarina and Debeli rtič, and Ankaran (the stretch from Sv. Katarina to Bivje) enjoyed a very pleasant climate with plenty of sunny days, it was sheltered from the wind, while the seawater was exceptionally clean. All of the above was very beneficial in the treatment of tuberculosis. It is little wonder then that they chose to establish two healthcare institutions treating tuberculosis – a convalescent centre for children at Valdoltra and a lung tuberculosis sanatorium at Ankaran. In 1884 in the city of Trieste, the so-called Società degli amici dell'infanzia (the Friends of Children Society) with the task of taking care of poor and sickly children. The society opened the city’s first crèche, introduced meals at schools, established and managed holiday homes (in 1899 it opened a holiday home in the hills at Hrpelje) and was involved in many other similar activities, but it placed special importance on its seaside convalescent home for scrofulous and weak children, which it managed from its establishment until 1904, yet the home was of seasonal nature (open during the summertime only), which turned out to be far too insufficient for successful treatment. Therefore the society’s great ambition was to have a year-round convalescent home, which only came to fruition after 25 years of activity by opening a year-round convalescent home at Valdoltra in 1909. And thus the very beginnings of the Valdoltra Hospital date back to 1904 when the Friends of Children Society was looking for a location to set up a new seaside convalescent home to treat children after it had closed down the St. Andrew’s convalescent home in Trieste. It appeared that they would be unable to open another convalescent home in 1904. But then the Società per la lotta contro la tubercolosi (The Society for the fight against tuberculosis) from Trieste offered it the coastal strip of its estate in Ankaran, while the Austrian Red Cross provided in with two prefab huts transported over from Vienna . The trial year of 1904 was successful, therefore the society carried out thorough research of the climatic and water conditions and, encouraged by the positive outcome, looked for and bought for the purchase price of 74,976 crowns an appropriate plot of land measuring 20 hectares and located at Sv. Hieronim of Valdoltra  and immediately started preparing the plans to establish the desired year-round convalescent home. The implementation of the entire project took longer than they had initially and rather overzealously anticipated. At first, detailed plans had to be drawn up for the design of the pier and water supply from own sources (1904/05), followed by blueprints for buildings that could accommodate 120 to 150 children in winter and up to 250 children during the summer months. This project was the work of an architect named Gruber, and it was carried out by the architect Gioacchino Grassi, who also made certain adjustments and corrections to the original plans. In late May 1907, the expert panel opted for variant A that foresaw a main pavilion along with 7 other pavilions and 4 gazebos . At the initial stage, a 90-metre long pier was built (finished in summer 1907), then in October 1907, construction began of the actual buildings. It turned out however that the plans were too ambitious to be carried out in full due to the lack of funds. At the society’s annual general meeting in June 1908, it was already emphasised that only the most essential of facilities would be built and the rest would have to wait for better times . Until May 1909, all of the buildings were completed except the surgery pavilion the construction of which was only at the initial stage, and works on the machine and boiler rooms were nearing completion. They sped up the construction work in the hope of being able to open the seasonal convalescence centre as early as summer 1909, and they succeeded in doing so . 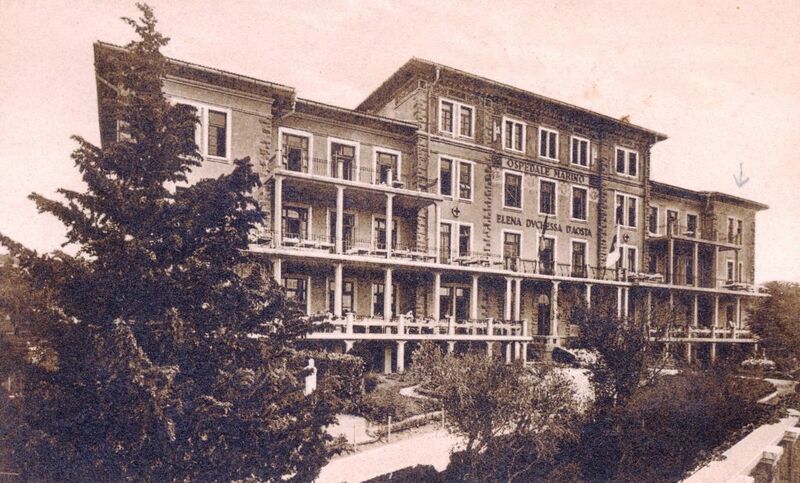 But it was not until 21 December 1909 that the official inauguration of the new Seaside convalescent home at Valdoltra – Ospizio marino di Valdoltra took place without any particular pomp, immediately admitting its first patients – 28 children from the hospital of Trieste . Valdoltra was the most advanced healthcare institution providing for conservative and surgical treatment of all types of bone and joint tuberculosis, orthopaedic ailments and injuries of the musculoskeletal system, so its official rank of convalescent home that it held for the coming 20 years was unjustified. It was intended primarily to treat poor children from Trieste and its surroundings as well as from Istria, but its patiens also included other children from all parts of the then Austro-Hunagarian Monarchy. The convalescent centre consisted of 7 buildings or pavilions: the main pavilion, now Pavilion A with 240 beds; the surgical pavilion, today Pavilion C, built and equipped to the requirements of state-of-the-art surgery of the time; the laundry and disinfection rooms; the kitchen and dining hall; the machine and boiler rooms; the the isolation room; the patio at the beach for air therapy. It boasted its own water and electricity supply; telephone links (between the pavilions, the floors in the main pavilion and with Trieste), sewage management system (through purification basins, waste water was conducted into the sea far from the convalescent home), well established access routes (a steamboat line to Koper and from then into Valdoltra, in the summer a direct connection between Trieste and Valdoltra, or a train line to Koper and a steamboat from there), and its own farmstead provided it with fruit and vegetables . Emphasis was placed on conservative treatment by the use of thalasso-, helio- and hydrotherapy. 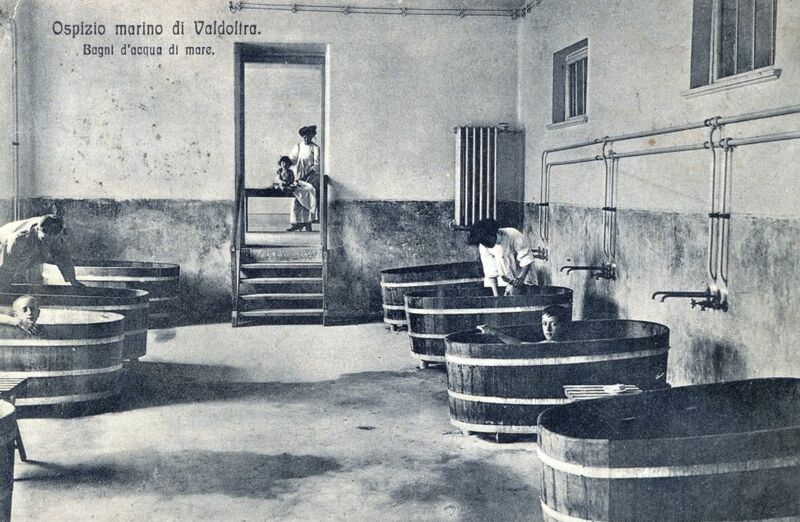 For wintertime bathing, wooden baths were used filled with heated seawater, and a swimming pool was built slightly later on. For 20 years, the head of the convalescent home was Chief Physician dr. Emilio Comisso (1875–1954), a pioneer in the field of orthopaedics, who was at the same time its expert medical and administrative director. He was assisted by a further two doctors, while the specialist consultation service was provided free of charge by specialist doctors from Trieste, and a stomatologist from Trieste would visit once per week. In 1912, the total number of employees was 64, almost half of whom were medical staff (3 doctors, 20 nurses and 8 nuns), while 6 families worked the fields of the estate . The good results of the therapies would attract growing numbers of patients to the hospital, so that in 1914, it had 300 beds (270 regular and 30 additional) . This development came to an abrupt end with the onset of the First World War, the complex was occupied by the Austrian army and turned it into military facilities. The Italians bombed it from the air (the kitchen pavilion and surrounding buildings were badly damaged) and at the very end, the Austrian soldiers looted it . The Italian military administration took up renovation immediately after having annexed the Slovenian Littoral and thus the hospital was able to admit its first patients as early as July 1919. In spite of the aid from the American Youth Red Cross that covered the expenses of treating hundreds of patients for two years, and the American Mission that sent over sick children from Vienna, the Friends of Children Society was no longer able to upkeep the institution, so it handed it over to the Red Cross Committee of Trieste on 1 September 1920. Under this new management, the institution flourished once more in several fields. Its patron became the Queen Mother – the Duchess Elena d'Aosta, after whom the institution was renamed in November 1921 to become Ospizio Marino ‘Duchessa Elena d'Aosta’, and towards the end of the 1920’s, it finally received the status of hospital – Ospedale Marino ‘Duchessa Elena d'Aosta’ . Minor restoration work took place already in the first post-war period. In the years 1930–1932, the Italian Red Cross carried out extensive renovations: among other things, they rearranged and modernised the facilities (this is when the operating room was moved from the surgery to the main pavilion), two new buildings were constructed (one for the medical and administrative staff, the other for female staff) and other facilities (including three concrete terraces at the beach) . In 1939, the Italian government built another patients’ pavilion (today’s Pavilion B) and thus completed the number of buildings that make up the Hospital complex nowadays. The Hospital was exceptionally well equipped for conservative and surgical treatment and physiotherapy, it boasted its own X-ray machine and cast manufacturing facility, introducing very advanced methods of treating bone and joint tuberculosis. The existing therapies were complemented with actinotherapy and they also introduced gymnastics – the so-called Swedish gymnastics for less affected patients, where those with more serious conditions only performed breathing exercises . The patients were cared for in many other ways, too: charity funding allowed the Hospital to build a theatre stage for performances by the patients themselves, but often also by amateur actors from Trieste and music ensembles. There would also be a film night once per week. Just a few years after the First World War, the Italian Red Cross organised schooling for the kids (it took place in a classroom, while immobile patients were being taught in their rooms) and saw to it that their certificates were publicly valid . On 1 June 1929, dr. Antonio Mezzari (1899–1977) took over running the Hospital and remained in charge until its activities ceased in September 1943. After Italy’s capitulation, the staff and civilian patients were moved to Italy and the German army occupied the premises of the Hospital. Following the Second World War, the territory where the Hospital is located was allocated to Yugoslav military administration, yet the fate of which state it would ultimately belong to remained unclear for a few years. Due to favourable conditions, the Yugoslav government made it part of its healthcare network, even though it was formally not yet part of the Yugoslav federation. The Hospital became the first institution in postwar Yugoslavia to begin treating bone and joint tuberculosis (OAT). In 1947, it was even transformed into the Federal Institute for OAT Studies, even though for a short while. When the Free Territory of Trieste was established, it ceased operations once more, and in 1951, a second renovation began that laid the foundations of today’s Valdoltra Orthopaedic Hospital. At first, the damaged buildings of the Hospital were being used by the military sanitary corps to treat convalescents and patients disabled in the war. In June 1945, the Hospital received its first wounded from the partisan hospital of Zadar, followed by prisoners of war who had been kept in southern Italy. It was mainly thanks to dr. Bogdan Brecelj that the Hospital was granted loans from the national government of the People’s Republic of Slovenia to begin renovating the buildings in order to establish a centre for the treatment of bone and joint tuberculosis. In the beginning of September 1945, the Hospital admitted its first patients. Medical procedures were performed by orthopaedist doctors from the Orthopaedic Clinic of Ljubljana, while the head of expert staff was dr. Bogdan Brecelj (1906–1986). The Orthopaedic Clinic also sent over some of its patients, who originated from all over Slovenia. This large-scale beginning of the first renovation was halted by the Paris Peace Treaty that in early October 1946 drew a new border in the former Julian Region, stipulating that most of the Slovenian Littoral and Istria should fall to Yugoslavia, while the narrow strip between the rivers Mirna and the town of Duino would become a newly established state-like entity – the Free Territory of Trieste, once again divided into two zones with two military administrations. 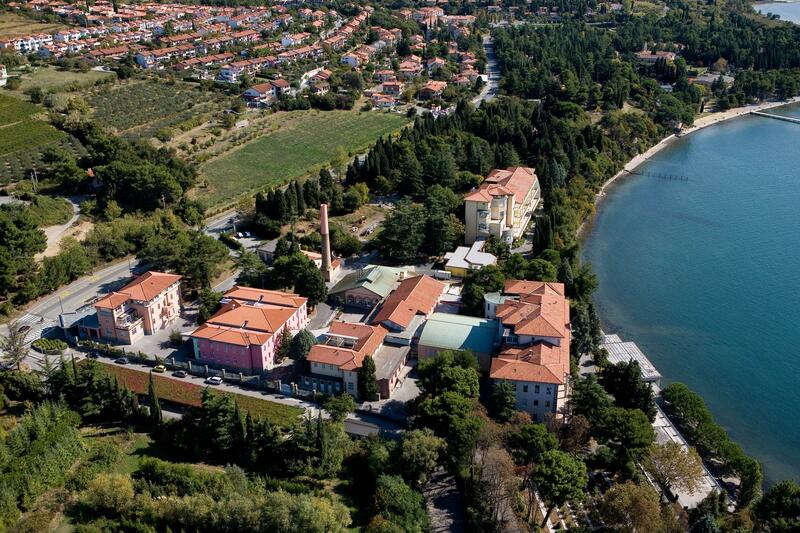 This created a new legal situation affecting the Hospital, so on 7 February 1947, three days between a peace treaty between Italy and Yugoslavia was signed, it was moved, along with its equipment, patients and institute to Rovinj in Croatia. In January 1949, a new hospital was founded at Stara gora near Šempeter in the Gorica area, where Slovenian patients would be moved soon afterwards. Until the start of the second post-war renovation in 1951, the buildings at Valdoltra were being used for other purposes. Therefore the Italian Red Cross claimed its property back in order to enable it to provide healthcare once more. In July 1950, the highest-ranking government bodies adopted the decision to re-enable the Hospital for its original purpose. The renovated premises received its first patients in August 1952 and the first surgical operation was performed on 17 April 1954. It was renamed Bolnica za kostno tuberkulozo Valdoltra (Valdoltra Bone Tuberculosis Hospital). The renovation plan foresaw that the existing buildings were to be renovated, the premises and equipment updated and adjusted to new methods of OAT treatment and patient rehabilitation. The Hospital still had no resident doctors – it was specialists and anaesthesiologists from the Ljubljana Orthopaedic Clinic who would take turns to work at Valdoltra. In 1954, the Hospital employed 112 people and was managed since 1950 by Vladimir Zorzut (1910–1985), while the head of its medical department remained dr. Bogdan Brecelj . Based on the London memorandum of understanding signed in October 1954, the Free Territory of Trieste was divided between Italy and Yugoslavia. This marked the beginning of a new period of growth for the Hospital. During that time, it refocused from predominantly bone and joint tuberculosis to other orthopaedic cases, therefore its name changed accordingly – from Bone and Joint Tuberculosis Hospital (1955) to Valdoltra Orthopaedic Hospital – Ortopedska bolnica Valdoltra (1961). Its patient structure changed as well – the numbers of sick children diminished and the numbers of elderly patients grew. When in 1956 the second renovation phase was completed, the Hospital reached the capacity of 420 beds. In the renovation, new OAT treatment principles were taken into account, calling for a different functional layout of the Hospital. Thus the attic of Pavilion A was converted into a brand new surgery block equipped with air conditioning, own sterilisation facility and anaesthesia room, followed by rooms for postoperative care with installations and modern reanimation equipment, outpatient clinics for intra-articular application of antibiotics for each department, the X-ray department was enlarged and fitted with new equipment and so were the laboratories, clinical examination room, central cast production facility, rehabilitation premises with departments for electro-, action- and hydrotherapy, as well as the gym hall; the central sterilisation facilities were rearranged and refitted, a modern X-ray scanner was purchased and the photo-lab refitted. But the renovation, building of new premises and updating continued even after that: up to 1975, a new pool was built containing heated seawater as was the central heating facility, the Hospital got a new phone switchboard, fuel-powered electricity generators, wastewater pumping facility (until 1974, it flowed to the sea), the sterilisation and X-ray departments were modernised, great quantities of medical equipment were purchased and in 1975, new premises were opened – a kitchen, dining hall, storage-basement area and a venue for events. At the Hospital’s 70th anniversary, the old residence hall for single occupants was transformed into a new outpatient clinic and a new residence hall for single occupants was opened at Ankaran. In the years 1986–1988 a new surgical block for modern orthopaedic procedures was built. At the same time, a department for post-operative care was built and equipped in Pavilion A. The Hospital still had its own farm estate but its activity was declining. In the mid 1970’s they stopped pig farming and only grew vegetables until it was completely abolished in February 1990 . As the residential buildings for medical staff were being built, the institution saw the arrival of the first permanently employed doctors, anaesthesiologists, nurses, physiotherapists, X-ray technicians and laboratory workers, etc. The first resident doctor was dr. Jože Verlič and the number of employees increased considerably in October 1956 when part of the staff along with the patients was relocated from Stara gora to Valdoltra, and it kept growing slowly but steadily. As a comparison: in 1960, 344 persons were employed at the Hospital, 137 of whom were medical staff, while in January 1990, out of 390 employees, 179 were medical staff, 25 being MD’s . The director of the Hospital was initially Vladimir Zorzut, while dr. Brecelj was still in charge of healthcare services. In 1958, the institution finally got its first resident specialist doctor, while the head of the Hospital became the surgeon Vaclav Pišot (1914–1984), who managed it with great success until his death. This allowed the Hospital to embark on an independent path of development. Dr. Pišot introduced new surgical methods of treating tuberculosis infection sites and with his team of young doctors successfully refocused the development of the Hospital on contemporary orthopaedics . After a period of nearly two years when the acting head of the institution was the surgeon dr. Aleksandar Špehar, in 1986, orthopaedist dr. Venčeslav Pišot took over the management of the Hospital. The patients mainly came from Slovenia and Croatian Istria, but also from all other parts of Yugoslavia. The outpatient clinical service was initially intended for patients from the surrounding areas and later on to everyone else. The new forms of orthopaedic illnesses have gradually shifted the age structure of the patients from the first to the second age and with the emphasis on surgical methods of treatment, the duration of treatment became shorter and consequently the capacity of the Hospital in terms of the number of beds could be reduced; in 1990, there were 330 beds . The Hospital has always taken care of all aspects of its patients’ wellbeing. In October 1956, a school and a pre-school were opened for the youngest of patients. A school was organised already in the first postwar period, from March 1946 through February 1947. It was reintroduced in November 1956 when part of the teaching staff was moved here from Stara gora along with the ill pupils. The Special School at the Bone Illness Hospital of Valdoltra, as it was called, initially consisted of three departments (lower secondary, primary and preschool education), but based of the school reform of 1958, primary education was transformed to last for 8 years, thus prompting the abolishment of the lower secondary school department. In adition to regular classes, the teachers provided additional activities that served as work therapy. They managed a number of groups (music, fine arts, and literature clubs – they even published a bulletin named The Blue Wave – as well as optional drama, poetry, chess and handicrafts extracurricular classes) which all of the ill children would be involved in. The young patients always put a great effort in these activities and so various performances, ceremonies and exhibitions were being held to mark special commemorative occasions . Until 1975, the Hospital also provided a number of workshops (wood-working, turning, mechanical, sowing, knitting and modelling) that served as work therapy for adult patients. Until the end of the 1960’s the Hospital also hosted sports and cultural events (folklore, theatre group) involving its staff as well as the teachers. These events were intended both for the employees and the patients, but local people attended them, too. Also participating were the employees’ children for whom a kindergarten was organised on Hospital grounds. Twice per week, it was movie night at the Hospital’s cinema . It is interesting to point out that, during that period, there were two occasions when the independence of the Valdoltra Hospital was jeopardised. The first time was in 1968 when the Municipality of Koper and the then Health Secretariat of the Republic tried to solve the financial and spatial problems of the Koper Hospital by attempting to merge it with OBV . The second time was in 1987 when new forms of healthcare organisation were being introduced. OBV was thus supposed to be integrated into the Koper Health Centre and through it into the newly established United Healthcare of Southern Primorska, the aim of which was to unite under one roof all of the hospitals, communal healthcare centres and other healthcare organisations located in the six municipalities of the Southern Littoral. On both occasions, the workers’ meeting turned down the proposals, saying that theirs is a specialist hospital intended for patients from all over Slovenia . In independent Slovenia, the Hospital has reached new levels of expertise and is currently the country’s biggest institution of its type covering over 50% of the capacities of Slovenian orthopaedics. It collaborates with all domestic and numerous foreign centres around Europe and America, often this involves mutual projects in the introduction of the newest surgical and therapeutic methods. Based on the decision of the Ministry of Health, OBV has become a learning centre for undergraduate and graduate education of medical staff. It is equipped with state-of-the-art technology that enables us to use the most advanced of methods in the treatment of each patient and therapies in line with European healthcare standards. In the newly independent country, the Hospital’s status was reformed. By a decree of 9 December 1993 issued by the government as the official founder of the Hospital, it became a public healthcare institute. Its first articles of association are dated 30 September 1994 and the last 1 February 2007, stating that the institute carries out healthcare activities at the secondary and tertiary levels by treating the illnesses and damages to the locomotory apparatus with special focus on arthroplasty, illnesses and deformations of the spine, endoscopy, athletic trauma, bone-joint tuberculosis and orthopaedic sepsis for the territory of the Republic of Slovenia. Within this framework, the institute carries out the following activities: hospital healthcare, specialist outpatient clinic, education, research and other activities of common importance. During the past two decades the Hospital was entirely renovated and the premises and equipment updated, the hospital activities being performed in 16 buildings with a total usable surface area of 17,394 sq. m.
In order to rationalise expenses, certain, predominantly ancillary activities, have been outsourced to external contractual providers. This also means a decrease in the number of employees, while the percentage of medical staff is increasing – in 1999 the hospital employed 342 people, 205 of whom were medical staff with 30 specialist doctors, and 310 people in 2009, 193 being medical staff with 35 specialist doctors and trainee specialists from the field of orthopaedics, anaesthesiology, radiology and physiatrics . The shorter duration of treatment also meant that in 1994 the school could be abolished. As a comparison: in 1980, Valdoltra treated 673 children of the compulsory school age (45 children per day) and the average duration of stay was 24 and a half days. In 1993, 470 children were being treated with the average duration of stay being 11 days . That said, paedagogical work still goes on at the Hospital courtesy of the teachers from the Dekani primary school . Since 1986, the head of the Hospital has been senior doctor Venčeslav Pišot, MSc. In close collaboration with an ambitious team of specialists, workers involeved in nursing, imagining diagnostics, physiotherapy and all other employees, he managed to bring the Hospital up to date, now aiming to develop it in the expert and scientific research to become a reference orthopaedic institution. Relazione sull' attività delle istituzioni sociali nell'anno 1904, Trieste: Società degli amici dell' infanzia, 1905. Emilio Comisso,Rendiconto dell'Ospizio marino di Valdoltra per il triennio 1910–1911–1912, Trieste: Società degli amici dell'infanzia, 1914, p. 129. Relazione sull' attività sociale letta al congresso generale ordinario il dì 29 giugno 1907, Trieste: Società degli amici dell' infanzia, 1907. Information on the society’s congress, Osservatore triestino, 25 May 1908. Relazione sull' attività delle istituzioni sociali nell'anno 1908, Trieste: Società degli amici dell' infanzia, 1909. Apertura dell’Ospizio marino in Valle d’Oltra presso Capodistria, Osservatore triestino, 23 December 1909. Comisso,Rendiconto dell'Ospizio marino di Valdoltra per il triennio 1910–1911–1912, p. 3–5. Emilio Comisso, Ospizio marino ‘Duchessa Elena d’Aosta’ in Valdoltra presso Trieste/Rendiconto per gli anni 1913–1922, Rome: Croce rossa italiana, 1923, p. 2. Antonio Mezzari, Ospedale Marino ‘Duchessa Elena d'Aosta’ in Oltra 1928–1932/IV Rendiconto statistico, Trieste: Croce Rossa Italiana, 1933, p. 17–24. Vaclav Pišot, Kratek oris zgodovine Ortopedske bolnišnice Valdoltra, Zdravstveni vestnik 40 (1971), p. 147. Comisso, Ospizio marino ‘Duchessa Elena d’Aosta’ in Valdoltra presso Trieste/Rendiconto per gli anni 1913–1922, p. 9–10. Summarised from the articles: Bogdan Brecelj, Bolnišnica Valdoltra nekdaj in danes, Zdravstveni vestnik 49/2 (1980), p. 67–68 and Pišot, Kratek oris zgodovine Ortopedske bolnišnice Valdoltra, p. 147. Archives of the Valdoltra Orthopaedic Hospital – Ortopedska bolnišnica Valdoltra (OBV). Data provided by the OBV’s management in September 1999. Brecelj, Bolnišnica Valdoltra nekdaj in danes, p. 68–69; Pišot, Kratek oris zgodovine Ortopedske bolnišnice Valdoltra, p. 148–149. Mara Koljenšič Pogačar, Zadoščenje (Iz življenja otrok v Ortopedski bolnišnici Valdoltra), Otrok in družina, 1978, p. 6–7; oral statement made by dr. Vida Gerbec 22 August 1999. Oral statement made by dr. Vida Gerbec 22 August 1999. OBV Archives: minutes of the work community meeting of 23 October 1968. At the time, the departments of the Koper General Hospital were scattered all around the coast of Slovenian Istria and had to work in entirely inappropriate spatial and financial circumstances. The problem of the lack of space of the Koper General Hospital was not solved for a long time, chiefly due to the lack of funds: first a location at Škocjan was proposed (1962), then a location in the area of the OBV and the use of all healthcare facilities from Ankaran to Debeli rtič (1968), and it the late 1970’s the newly-built General Hospital at Izola began operations. OBV Archives: minutes of the workers’ council meeting of 1 April 1987 and workers’ meeting session of 24 April 1987. Data provided by the OBV’s management in September 1999 and February 2009. Data provided by the OBV’s management in February 2009.